Eventide's first foray into the world of plug-in effects sees them recreating five of their classic '70s processors. But is there still a place for them in today's studios? The big names in hardware processing have reacted to the rise of plug-in effects in very different ways. Some, like TC, have enthusiastically embraced software, while others have been more reluctant to make their designs available in virtual form. Until now, Eventide have been firmly in the latter camp. You could find their Harmonizers and other effects in every pro studio in the land, but you'd look in vain in your plug-ins folder for them. Eventide's Clockworks Legacy bundle is thus being heralded with more of a fanfare than your average set of plug-ins. Don't buy it expecting to get an Orville or an Eclipse in software, though: the five plug-ins in this package are all modelled on classic Eventide processors from the 1970s — the company's full name was originally Eventide Clockworks. On offer here are recreations of their very first Harmonizer, the H910, along with its more sophisticated successor the H949, the Omnipressor dynamics unit and the Instant Phaser and Instant Flanger. They are available only for Mac-based TDM and HD systems; on HD systems, all plug-ins support sampling rates of up to 96kHz, and Instant Phaser and Omnipressor also work at 192kHz. The Clockworks Legacy box would be large enough to ship a small car, and is weighty enough to suggest that there's a printed manual inside. Instead, the space is filled with a mass of black fabric. I thought this might be some fiendish new copy-protection scheme, but it turned out to be nothing more than an elephantine Clockworks Legacy T-shirt. It's a nice idea, but I suspect most people would have preferred a manual — and now that Barry White has gone to his reward, I'm not sure who will actually be able to wear the thing. Authorising the Clockworks Legacy bundle gave me my first brush with the iLok protection system that is becoming standard for Pro Tools plug-ins — unlike some plug-ins, the Clockworks Legacy bundle does not give you the option of using challenge-and-response authorisation instead. With the CD, you get a credit-card sized piece of plastic. From this, you punch out a smaller piece of plastic with metallic traces on it, and at the prompt, you insert this into your USB iLok key. The system has the obvious advantage that your authorisation is transferable between machines, because it's the iLok key that is authorised, not the hard drive. It also has the obvious disadvantage that your authorisation could quite literally go down the drain if the key falls out of your pocket at the wrong moment. On balance, it probably is an improvement over the old floppy disk key system, but it's a bit disconcerting to think that a two-inch-long piece of green plastic can end up holding thousands of pounds' worth of investment in software. The process of twisting out the plastic card and inserting it into the iLok can also be a bit nerve-racking, though on the plus side, the discarded plastic tab makes a serviceable guitar pick. When the H910 first appeared in 1975, it was one of the first commercially available digital processors. It was certainly the first device that could take an incoming audio signal and repitch it at will. Pitch-shifting was controlled either manually, using the unit's front-panel knob, or using the optional HK940 keyboard controller, which allowed you to 'play' the pitch-shifted sound. The H949, which was launched in 1977, eliminated much of the glitching that was characteristic of the original, offered a wider range of pitch-shifting, and added a number of new features including reverse delays and flanging. 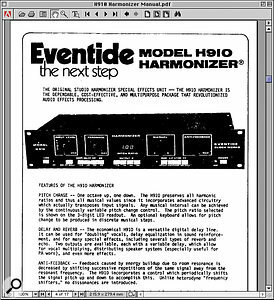 Eventide claim, plausibly enough, that it "may even have been the world's first multi-effect audio product". Pitch-shifting technology has come a long way in a quarter of a century, and it's fair to say that for many of their intended functions, the original Harmonizers have been superseded by newer products. When it comes to fixing up an off-key vocal performance, software such as Auto-Tune and Melodyne offers much more transparent pitch-shifting and can detect pitch deviations and compensate automatically, without requiring skilful manual control. Similarly, there are now easier and more natural-sounding ways of creating artificial harmonies than using multiple Harmonizers, while other functions of the hardware units, such as the H910's feedback suppression, will be irrelevant to most Pro Tools users. So what's the point of recreating these digital dinosaurs in software? In a word: character. They may be of limited use for transparent pitch correction, but the H910 and H949 are effects machines to be reckoned with. The H910's combination of decidedly coloured, low-bandwidth pitch-shifting and multi-tap delay with feedback can produce results ranging from subtle flanging and ADT to weird and wonderful robot voices. The H949 adds random and micro-interval pitch-shifting, a built-in flanger, a 400ms loop sampler, a feedback loop EQ and a Reverse mode, opening up whole new areas to the intrepid knob-twiddler. You can create nasty metallic reverbs, rich flanging and chorusing, moving delays where each repeat is progressively shifted up or down, and strange stuttering percussive noises. You could turn Kate Bush into a snarling wolf or Johnny Cash into a chipmunk. I wasn't able to A/B the plug-ins against the hardware units, but it's a measure of the accuracy with which Eventide have recreated them that you constantly find yourself thinking "Ah. So that's how they got that sound on that record." Any self-respecting Stranglers fans who try out the manual pitch-shifting, for instance, should be prepared to find themselves chanting "We are the men in black / We don't approve of artificial food...", while you could probably recreate every silly voice in the entire Hitchhiker's Guide To The Galaxy TV series with H910 alone. When you get bored of alien voices, you can try dirtying up your drum tracks, or using the Harmonizers in series with Amp Farm to recreate classic techniques for thickening a guitar sound. Whatever you do, the results are very individual: no other Pro Tools pitch-shifting algorithm I know of sounds similar, and you won't get these distinctive chorus or flange effects from any of the Mod Delay plug-ins. Thanks to Pro Tools' automation facilities, the plug-in Harmonizers offer a level of controllability that would be hard to achieve with the hardware units. Every control can be automated, and the pitch-shift control itself can be linked to a MIDI input, so that you can either 'play' harmonies from the keyboard or use the pitch-bend wheel for dynamic control over the amount of pitch-shift applied. Option-clicking usually returns any control to its Off or neutral position, which is particularly useful in the case of the pitch-shift control, as this would otherwise be a fiddly operation. In other areas, the faithfulness of Eventide's recreation limits the Harmonizers' flexibility when compared to plug-ins that don't seek to recreate vintage units. Each one offers the same fixed delay times as the original, for instance, with no facility to sync delay time to Pro Tools' tempo. Nor have Eventide added the ability to pan individual repeats within the stereo field: both H910 and H949 are resolutely mono. You can use them as multi-mono plug-ins on a stereo track, but since each mono instance uses an entire Mix card chip, you'd better have plenty of DSP spare. Given that the original Harmonizers must have had less processing power than today's toasters, it's a bit ironic that it takes so much Pro Tools DSP to recreate them! 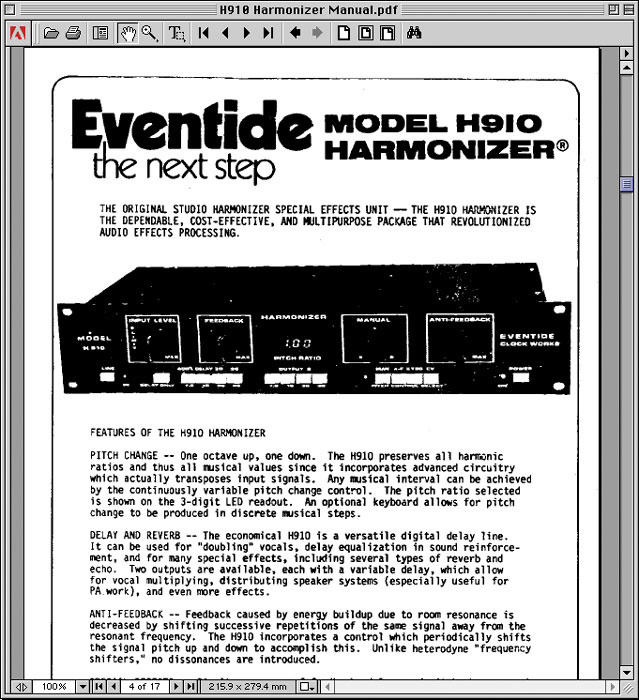 Eventide pioneered the idea of the multi-effects unit, but they also made processors devoted to a single sound. The company claim that they inadvertently invented the phasing effect in the design of their Instant Phaser, which was designed to recreate the sound of tape flanging, while the Instant Flanger was a later and more sophisticated attempt at the same goal. Both are recreated here. The Instant Flanger might not be as well known as the Harmonizers, but its plug-in recreation is easily the best-sounding implementation of this effect I've ever heard in software. All too often, digital flanging effects sound thin and metallic, and rob the source of body rather than adding depth and thickness. Eventide's Instant Flanger has a refinement and subtlety that puts the rest to shame. At one end of the scale, it can add a real sense of stereo width to a mono source without noticeably changing the sound itself, while at the other, it approaches the kind of jet-plane effect beloved of '60s producers, although it might not go quite far enough in this respect for some tastes. Between these extremes lies a fertile land of shimmering guitars, impossibly rich strings and watery backing vocals which could take months to explore fully. One of Instant Flanger's most impressive attributes is the ability to create movement in a sound without introducing too much obvious periodicity, as simple flanger plug-ins based around a single LFO inevitably do. Instant Flanger does include a built-in oscillator for those kind of effects, but adds other control elements and modifiers too. A Bounce control is designed to mimic the characteristic behaviour of the motors in a tape deck when changing speed, there's a manual control which allows you to sweep the flanging effect by hand, and there's an independent Remote control which allows you to sweep the effect using the mod wheel on a MIDI controller. There's also a Depth control which allows you to introduce the uneffected signal back into the mix, creating additional phase-related artifacts, and an envelope follower. The key to Instant Flanger's subtlety is that you can use any or all of these control elements at once by clicking their front-panel In buttons. Instant Phaser also offers multiple control sources — in this case Remote, Oscillator, Manual and Envelope — but only allows one of them to be active at once. Although it's simpler than Instant Flanger, it offers similar dollops of warmth and richness, without becoming nasal or robbing the sound of its guts. Again, low settings can add stereo interest and depth without making a sound obviously effected, while thick, whooshing frequency sweeps are firmly on the agenda at high settings, and it's probably better at recreating extreme 'Itchycoo Park'-style drum sounds than Instant Flanger. Fewer controls mean that the middle ground is less versatile, but there's enough here to bring a smile to the face of guitarists and keyboard players who remember the '70s. The DSP load is also a little lower: one-third of a Mix card DSP chip, compared with the 50 percent taken by Instant Flanger. Like the real things, the Instant Flanger and Instant Phaser plug-ins are available only in mono-to-stereo versions. I realise that stereo-to-stereo versions wouldn't be authentic, but I would have found plenty of use for them. The final plug-in in the Clockworks Legacy bundle is Omnipressor, based on the analogue dynamics unit of the same name. Omnipressor has an unusual and initially rather baffling interface. There are orthodox Threshold, Attack and Release time controls, plus a virtual VU meter which can be set to display input level, gain reduction or output level. So far, so straightforward, but it's to the right of the VU meter where things begin to get weird. In place of a conventional Ratio control, there is a knob labelled Function, plus two more marked Atten Limit and Gain Limit. The documentation includes PDF versions of the original manuals for all five products. The Function knob does, in fact, control the compression ratio, but it goes much further than you might expect. Between its leftmost point and the centre, it causes Omnipressor to act as an expander/gate rather than a compressor, varying the expansion ratio from 1:10 to 1:1. As you turn it further to the right, it becomes a compressor, with the compression ratio steadily increasing until you get to the three o'clock position, when it reaches infinity:1. But it doesn't stop there: over the last part of its travel, the Function knob actually introduces negative compression ratios ranging from -8:1 to 1:-10. In case you're wondering what that means, the answer is that it actually reverses the dynamic range of a signal, so that peaks in the source are massively attenuated and quiet sections massively boosted. The Atten Limit and Gain Limit knobs override the action of the Function knob, allowing you to impose a fixed maximum amount of attenuation or gain that can applied, regardless of threshold and ratio. Additional buttons allow you to cut the bass content in the signal reaching the detector circuit, insert a fixed 10, 20 or 30 dB cut in input level, and boost the output level by similar amounts. You can use an external signal to feed the side-chain. I experimented with using Omnipressor as a conventional compressor in the usual applications — vocals, drums, buss compression and so on — with mixed results. It works very well on drums, but has a rather aggressive character on vocals which wasn't all that sympathetic to any of the singers I tried it with. It's also a bit awkward to set up, thanks to the lack of a variable make-up gain control. You need to keep trimming the level to compensate as you adjust Omnipressor settings, which is a bit of a pain. This is one point where I'd definitely rather have seen realism give way to convenience, and I can't see how adding a fully variable output gain control would have compromised authenticity too much. What Omnipressor can do that most other plug-in compressors can't is create some very strange dynamic effects. You can restore punch and life to a dull drum loop with the expander, or do evil things to cymbals with the negative compression, which often has much the same effect as listening to a recording being played backwards. Using a rhythmic side-chain signal to gate or negatively compress a sustained sound generates additional weirdness. However, I found that more extreme settings often made Omnipressor difficult to control, and it's easy to inadvertently generate clipping when you're using high expansion ratios or negative compression — the lack of continuously variable input and output gain controls is probably more annoying within the digital domain than it was in an all-analogue studio. You probably won't find yourself putting Omnipressors across every track in your mix, but it is definitely worth having, as there will be occasions where it gives you something that no other plug-in compressor can provide. Unlike the other plug-ins in the bundle, it will work in stereo, too, although you have to select it as a multi-mono rather than a stereo plug-in. A mono instance uses one third of a Mix card DSP chip. As anyone with a MIDI + Audio sequencer will know, it's easy to be greedy when it comes to plug-ins, installing anything and everything you can get your hands on. They all promise so much, but it's a sad truth that many of them will end up gathering virtual dust in the corner of your plug-in rack. Some of them sound cool on their own but never seem to fit into your mixes; some have interfaces so unwieldy that life's too short to ever get to grips with them; still others just don't seem to deliver on their claims of vintage character or warm sound. None of these problems is likely to arise with Eventide's Clockworks Legacy plug-ins. A lot of effort has gone into making them look and feel like the original hardware units, but that's not what's special about them. The main thing is that they sound fantastic, and even though they're recreating technology that is a quarter of a century old, they're immediately usable in modern musical contexts. Omnipressor offers some unique dynamic effects that could be ideal for drum-led dance music, while the Harmonizer emulations have much more than mere historical interest: you wouldn't try to use them for transparent pitch correction, but they offer a wealth of weird and wonderful effects. If, like me, you've never been very happy with other software flange and phaser effects, you may find that Instant Flanger and Instant Phaser are a revelation. Either way, the Clockworks Legacy bundle is available as a free time-limited demo, and if you own a Pro Tools Mix or HD system, you owe it to yourself to try it out. The plug-ins sound great, and they don't sound quite like anything else. Instant Flanger could well be the best plug-in around for classic modulation/delay-based effects. MIDI control and automation add to the possibilities of the originals. Omnipressor can be awkward to set up and control. Harmonizers use an entire Mix card DSP chip. The originals may be museum pieces, but the plug-ins definitely have a place in the digital studio. HHB Communications +44 (0)20 8962 5000.